The Staffordshire Bull Terrier is a smooth-coated dog with great strength for his size. He is active and agile and comes in six color varieties: solid red, fawn, white, black, blue, or brindle. Today, he serves primarily as a family companion and is seen in the show, obedience and agility rings. The Staffordshire Bull Terrier draws its character of indomitable courage, high intelligence, and tenacity from his past history. The breed originated in the nineteenth century when coal miners in Staffordshire, England, wanted a small, fast dog. They combined the Bulldog with a small local terrier similar to the Manchester Terrier. The result was the Staffordshire Bull Terrier that we know today. The Staffordshire Bull Terrier is extremely courageous and obedient, highly intelligent and affectionate with a sense of humor. This, coupled with its affection for its friends, and children in particular, its off-duty quietness and trustworthy stability, makes it a foremost all-purpose dog. He looks forward to daily exercise, and his powerful jaws enjoy a supply of sturdy chew toys. While he is a sweet-tempered, affectionate dog, his strength and determination require an experienced owner who can work with him in a firm, but gentle way. The Staffie?۪s coat is short and smooth, and needs only a quick brushing once a week. Terrier Group; AKC recognized in 1975. Ranging in size from 14 to 16 inches tall at the shoulder and 24 to 38 pounds. 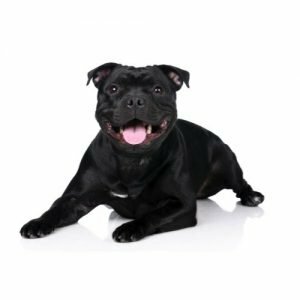 Are you interested in purchasing a Staffordshire Bull Terrier?